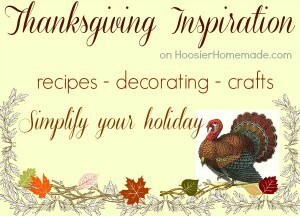 With Thanksgiving quickly approaching, I thought it would be great to share a few pie recipes with you. It’s funny how traditions during the holidays live on and on, and each holiday seems to have it’s own traditions. Thanksgiving and Pies just go together. 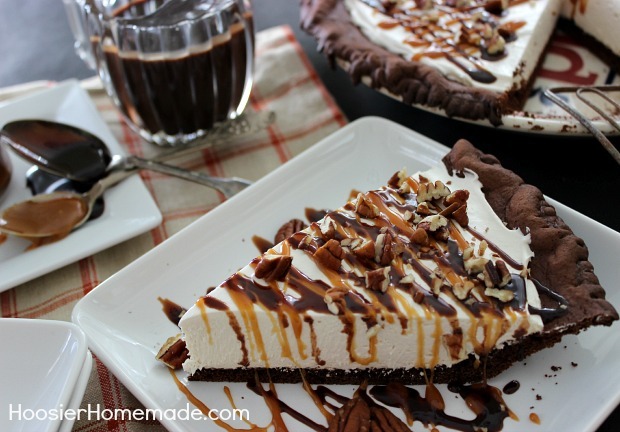 This Turtle Cheesecake Pie is perfect for Thanksgiving, but scrumptious of course any time of year. Ever since I gave the Cake Mix Pie Crust a try, I have been dreaming of a pie to make with a chocolate cake mix pie crust. And I’ll have to say…it turned out pretty good! Now I’ll have to admit, I’m not the best pie crust baker in the world – not even close – but looks aren’t everything, right? As long as it’s delicious, that’s all that matters. After the crust is baked and cooled, the filling is super easy. 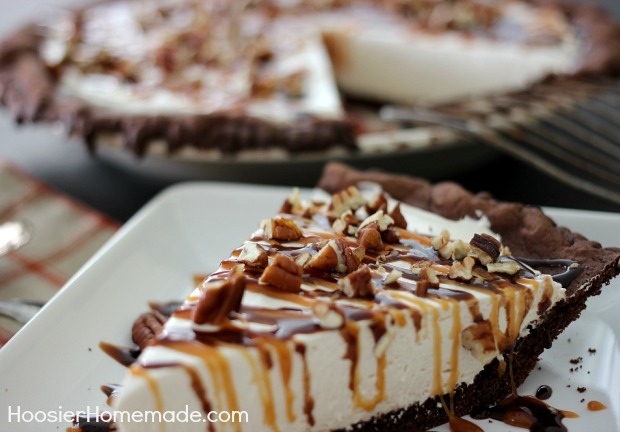 I used my favorite No Bake Cheesecake Recipe and changed it a bit to pair with the caramel and hot fudge flavors, I used cream cheese, brown sugar, vanilla and Cool Whip whipped topping, it can also be made up a day or two ahead of the holiday, making it a great make-ahead Thanksgiving Dessert. 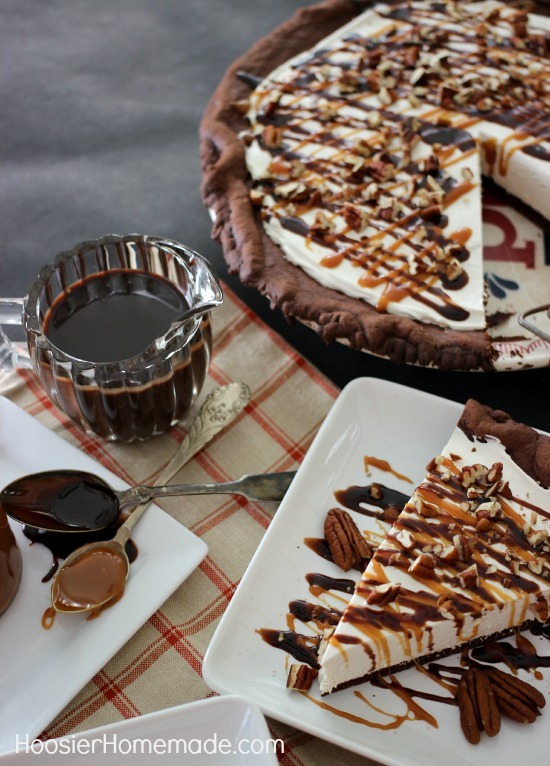 For the topping, I made Caramel Sauce and Homemade Hot Fudge Sauce, which are both made with just 2 or 3 ingredients and go together in minutes. But you could very easily pick up bottles of ice cream topping. Hi John, it resemble a cookie crust. Not too brown, but baked enough to be firm to the touch. This looks amazing! A question for you though, can you use heavy whipping cream and make the whipped cream as opposed to using coolwhip? Hi Janie, you can try, I have never made it that way. The Cool Whip has a stabilizer in it that works well. But I think it’s definitely worth a try to use regular whipping cream. Okay, so I had a horrible time with the crust it was so so sticky. What did I do wrong? I ended up just putting it in the pan and spreading it with a wet spoon. The filling was very easy. I gave it chilling now and hope it is going to be easy to cut into tomorrow. Really I just hope it tastes good.The filling tasted so yummy. Hi Kimberly, sorry you had trouble. I’m not sure, it wasn’t super sticky for me. 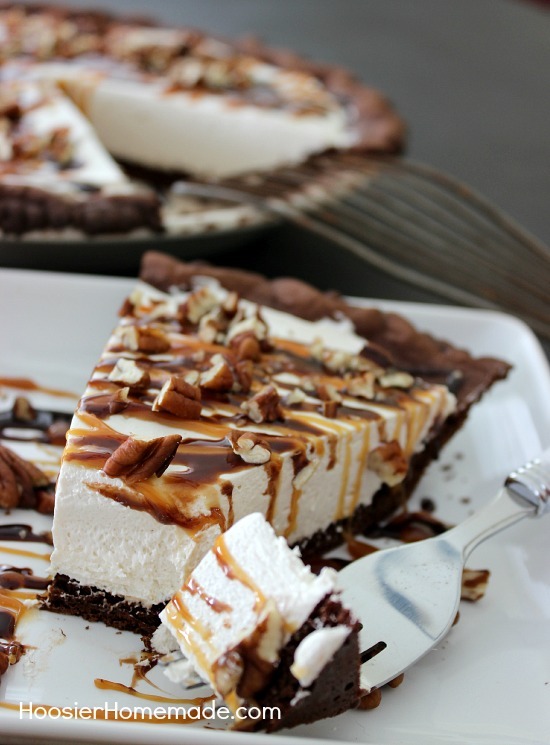 Possibly add a little flour or cocoa powder and work it into the crust. Hope it turns out okay for you. Let me know. This pie is RIDICULOUS! In the best of ways, of course. 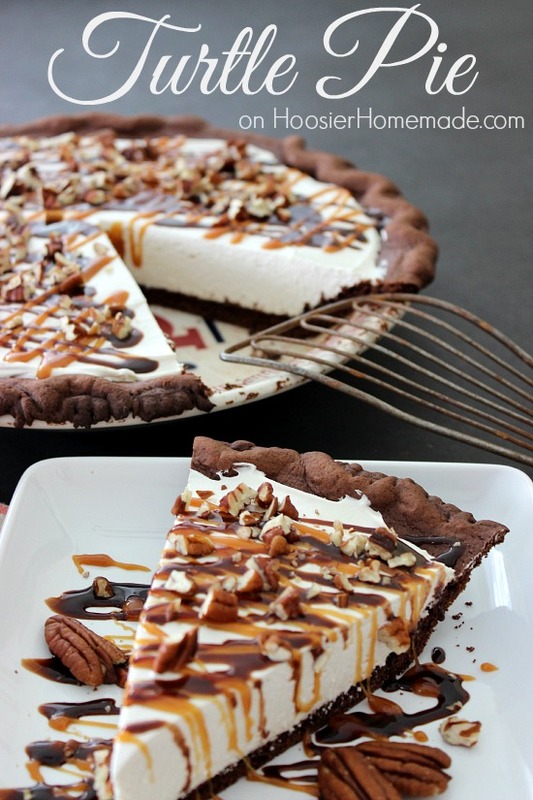 I had never heard of cake mix pie crust, but now I’ll have to try it. This looks amazing! Hi Katie, the dough makes 2 crusts. The edges are shaped with your fingers, just like a normal pie crust would be. You can also use a fork around the edge. 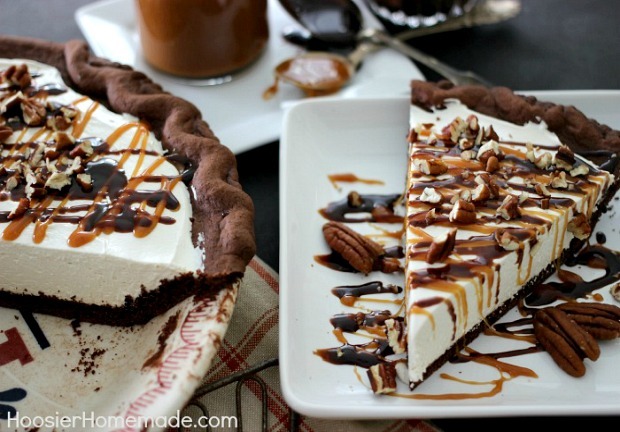 Does the filling make enough for 2 pies as well? Hi Cathy, only 1 pie for the cheesecake recipe. hi how many individual tartlets would this recipe make? Hi Tracy, I’m sorry I haven’t made them into individual tartlets. It would depend on the size, I would assume 6-8.